SF Underground at SOMArts and New Taste Market at St. Gregory's church. We spent our weekend in two very different, but equally community-driven food “markets” where we ate amazing food while supporting causes we believe in. The somewhat regularly scheduled SF Underground Market, presented by forageSF, brings together a diverse collection of home cooks and small businesses that serve and sell foods not typically available in your local supermarket. The market supports small producers by providing them space to promote their creations to a sophisticated and ever hungry public. Markets like SF Underground Market encourage the production of healthful, organic, low-environmental impact foods. Consumers support it by buying. 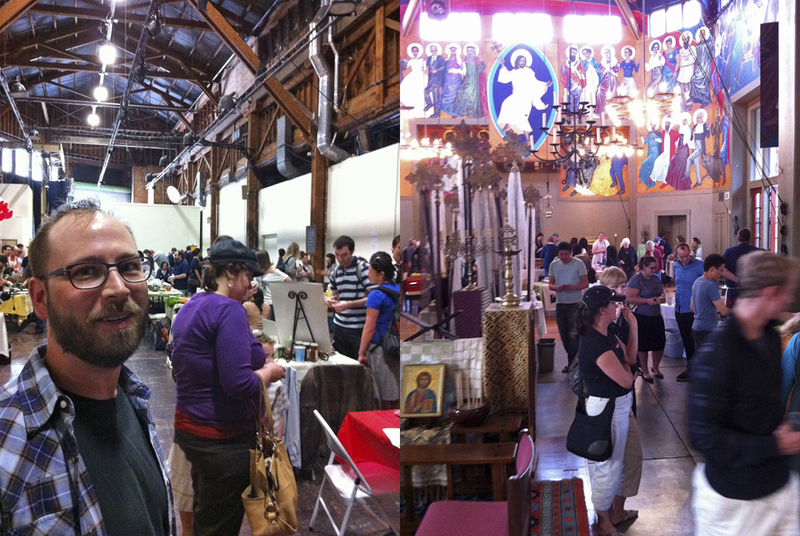 Like others we’ve attended, this weekend’s SF Underground Market was a huge success by any measure. 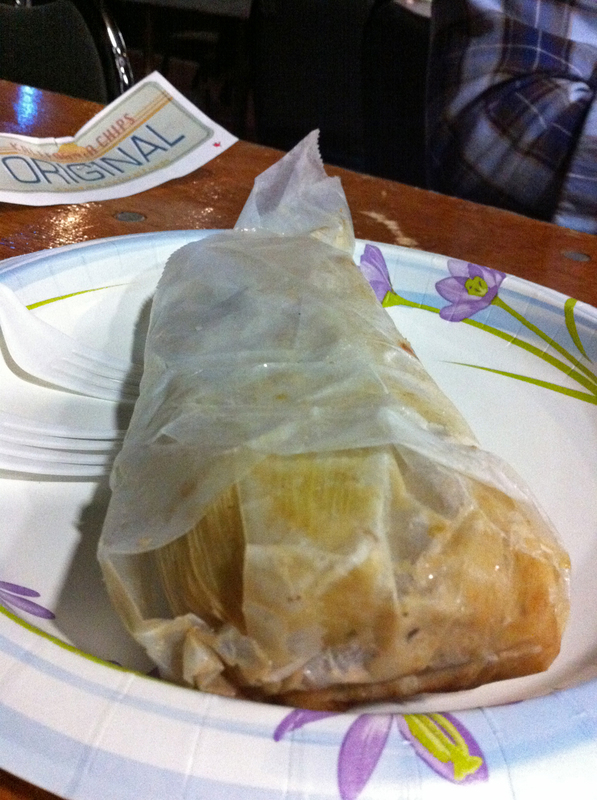 We loved the crunchy kalefornia “chips” which were tangy and flavorful by Samsara Natural Foods and we inhaled the chili relleno tamale served by Tamales by Rudy. We finished our first half of our lunch with individually filtered coffee by Telegraph Coffee and completed our tour around the floor with a giant bittersweet chocolate chip cookie, enhanced by the now-ubiquitous fleur de sel (sorry, we forgot the vendor’s name). The food was exceptional and the lines to get in were short but we also got there very late in the day and they we just about to switch over to the evening’s fare. Next time we’ll have to get there a wee bit earlier or show up later! 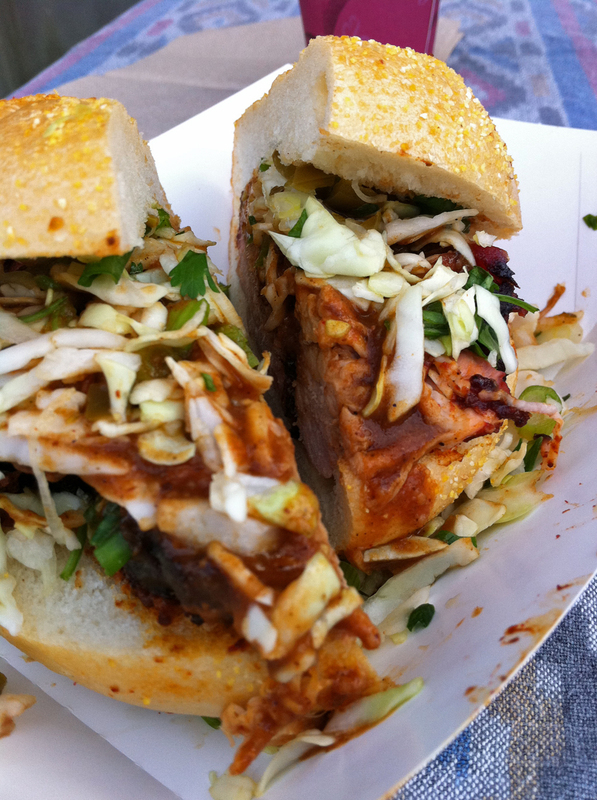 Pulled Pork Mole Sandwich by Mexican BBQ. For most, spending time at one food market on a Saturday afternoon would be plenty. But for a couple of guys who can’t say no to variety, one just wasn’t enough. We’d picked up a flyer for the New Taste Marketplace, presented by St. Gregory of Nyssa, the week before while grabbing a huge sandwich at Hazel’s Kitchen, one of the many fine eateries on Potrero Hill. New Taste Marketplace was new to us so we marked our calendars and made a plan. We couldn’t have been happier with the decision to check it out. Like the SF Underground Market, New Taste Marketplace brings together under one roof a collection of local food purveyors. Most of them sell something they’ve concocted in their home kitchens. We ate a delicious pulled pork sandwich by Mexican BBQ’s Molly Raney, a bite full of a beautiful mini cupcake by Nute’s Cupcakes, and washed it down with fermented ginger beer compliments of Jesse Friedman of BeerandNosh.com. On our way out we chatted with a Sunset neighbor that makes granola, Michelle Pusateri of Nana Joes, and picked up a bottle of local lavender honey from California Native, compliments of Cheryl Hendrickson. Our bellies were too full to try the Cincinnati Chili Spaghetti by Urban Chef or the smoked meats from Slow Hand BBQ, but they are certainly on our list for our next visit. All of the participants are there to help raise money for St. Gregory’s food pantry which distributes food to hundreds of local families every Friday. Without exception, the food was terrific. And while we noshed on more good food than is right, we were blown away by the warmth and kindness of the volunteers who greeted us at the door and the cheerfulness of the vendors. This is a crowd of folks who are doing good things for all the right reasons. We even met a nice couple that we will soon be bartering with, some of our venison for photography lessons. Soon our photographs will be even more appetizing. 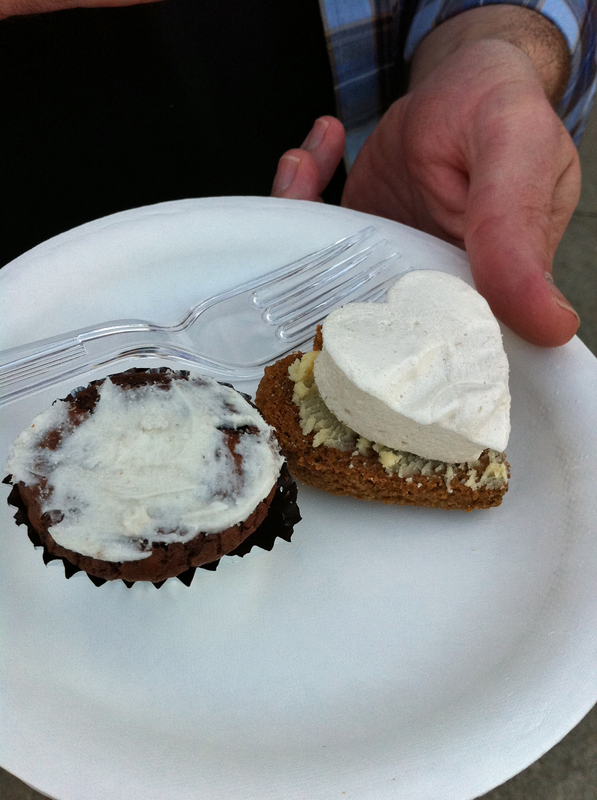 Desserts at New Taste Market; brownie bite with lavender frosting and white chocolate s'more. Eating mindfully doesn’t always have to mean eating to avoid the negative. Our food choices come with a range of positive consequences that benefit our bodies, the farmers who supply our food and the farm workers who are able to support their families without risking exposure to toxic chemicals in the field. And our food choices can benefit our communities in direct ways. Our food choices do matter. How we spend our time and money to feed ourselves affects not only us, but our communities and the environments that sustain us. Make your food choices count for more than the satisfaction of a craving. We’ll continue to share our suggestions for how best to do that while bringing you delicious recipes to make it all work for you at home. We also suggest that those of you who are not as fortunate to live in San Francisco, or another large city, watch out for these types of neighborhood gatherings or create your own with a few friends. Helping to expand the family table to include your neighbors and make food that all of us should be eating, and not what the advertisers want you to eat, is a true gift of kindness. We should all be lucky enough to enjoy wholesome food choices.